The Wusthof Knife..."Elegant" is the perfect, one word description. The artisans who make every Wusthof Knife have a recipe for success, and it's not a secret. 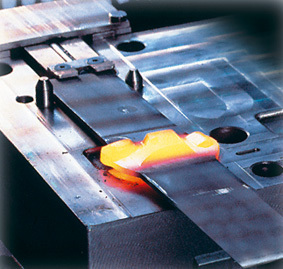 They start by precision forging every knife from their own high carbon, no-stain steel alloy: X50 Cr Mo 15; which is surgical steel with .5% carbon, 15% chromium, and Molybdenum. Over 200 talented crafts-people then cooperate during the 40 major steps required to grind, shape, heat treat, assemble, polish, sharpen, and inspect each knife. Their goal is perfection, and every Wusthof Knife is truly elegant. The bolsters of Wusthof knives are shaped and proportioned so that the heel of the blade will not abrade the fingers, and to provide leverage points for the thumb and index finger. The handles are available in classic and modern ergonomic styles, designed to provide a comfortable, natural grip that makes the knife feel like an extension of the hand. 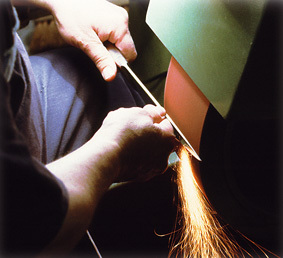 Every blade is hand honed and laser inspected, and the blade shape of every model is optimized for it's specific task. Some are serrated, some are flexible, and almost all are made with a slight 'belly' that allows the cutting edge to be rocked back and forth. The 'Gourmet' Wusthof Knife series was created for price-conscious shoppers. And the chef can begin collecting these Wusthoff-Trident knives by the piece or by the set. A great 10 piece and 18 piece set are available, and also a 7 pc. steak knife block. A couple of the individual knives you can choose from are the 7" Hollow Edge Santoku and the 10" Ham Slicer. Below are some of the Gourmet series knives available today. Chef Emeril Lagasse, the Food Network Super Star, teamed up with the crew at Wusthof-Trident and helped them to present the Emerilware Knife line. It is based on the Gourmet series, and each piece in the collection was hand picked by Emeril himself. The blades are high carbon stain resistant steel, with no bolster. And Emeril knives are available in a 3 pc paring set, 2 pc starter set, 6 pc essentials set, and an 8 pc everyday set. Below are some of the Emerilware knives available today. The 'Grand Prix II' Wusthof Knife series of precision forged, hand honed kitchen knives offer a modernized, ergonomic version of the classic handle shape, without rivets. 26 different models of Grand Prix knives are available, including 2 Japanese style knives, a flexible salmon slicer, and a flexible filet knife. This series also offers a cleaver, steak knives, scissors, shears, meat fork, and a sharpening steel. Below are some of the Grand Prix 2 series knives available today. The 'Classic' Wusthof Knife series is also precision forged and hand honed, with smooth, classically shaped full tang handles that are triple riveted. They've been designed to provide maximum strength, safety, balance, and ease of use. 58 models are offered, including japanese styles, ham slicers, flexible salmon slicers, flexible boning and filet knives, cleavers, meat forks, a sharpening steel, and a diamond coated sharpening steel. Below are some of the Classic series knives available today. The 'Culinar' Wusthof Knife series is precision forged and hand honed as are all Wusthof Trident knives, and the elegance of these knives is accentuated by beautiful, ergonomically shaped, stainless steel handles. Among the 26 Culinar models are a Japanese style knife, a flexible filet knife, flexible salmon slicer, an offset blade bread knife, steak knives, steak knife and fork sets, a carving knife and fork set, 3 models of cheese knives, scissors, shears, and a diamond coated sharpening steel. Below are some of the Culinar series knives available today. And it will also add a touch of elegance to your kitchen and the dishes you prepare. You might enjoy taking a look at the Wusthof Knives for sale in our on-line German Knife Shop. Return from Wusthof Knife to the German Knife .com home page.